We're heading into the hottest time of the year in Spain now. Generally speaking you can expect high temperatures on the south and east coasts, even higher central Spain. The north and north-west is warmer than it was some cool days can be expected. While Spain doesn't get as much rainfall as other European countries, some rain is a possibility at any time of year. Remember that we're talking averages here. Weather throughout the world is unpredictable, so don't take what you read on this page as gospel. Spain in July: Best Cities Where to go in Spain in July. Summer in Madrid can be uncomfortably hot - and July is when the stifling heat really hits. Though not as bad as August, many businesses close up shop at this time of year and head to the beach, so you may find that your favorite bar or restaurant is closed. The average maximum temperature in Madrid in July is 90°F/32°C and the average minimum temperature is 61°F/16°C. July in Barcelona is hot and sunny and the beaches will be packed with northern Europeans racing to turn from deathly white to deadly pink. Barcelona is far more bearable than Madrid in the height of summer. Some rain is possible but rare. The average maximum temperature in Barcelona in July is 81°F/27°C and the average minimum temperature is 66°F/19°C. July in Andalusia is hot, hot, hot! Seville becomes a ghost town in July and August as the heat is unbearable, but the beaches will be very busy. You can generally guarantee cloud free days for most of July, but don't rule out a spot of rain. The average maximum temperature in Malaga in July is 84°F/29°C and the average minimum temperature is 68°F/20°C. 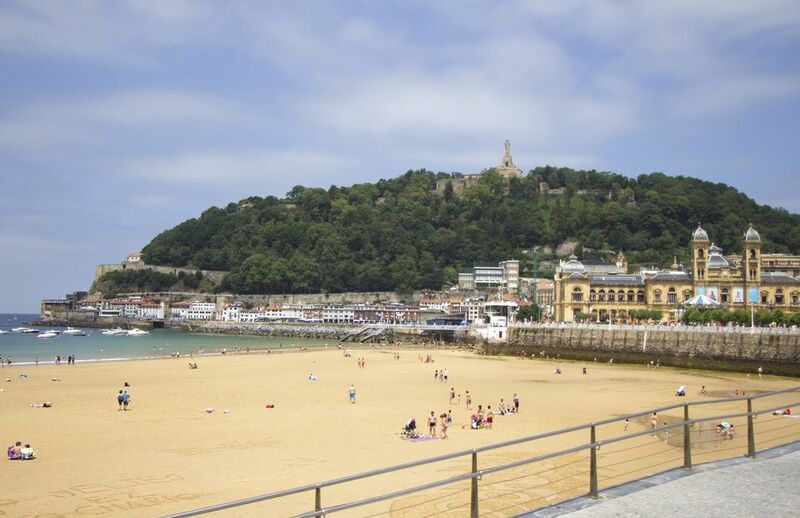 July is a good time to head to the Basque Country and other parts of northern Spain. The rain has mainly subsided and generally warm days can be expected. The weather isn't as reliable as it is in the south, but the locals won't be complaining! The average maximum temperature in Bilbao in July is 77°F/25°C and the average minimum temperature is 61°F/16°C. July is the driest month for Galicia and Asturias, but that still means rain can be expected on approximately one day in three. The Spanish often head to the beaches of Galicia around this time, so good weather and suntanning is possible, but they have the luxury of being able to check the weather report before organizing a last-minute trip. The average maximum temperature in Santiago de Compostela in July is 70°F/21°C and the average minimum temperature is 61°F/16°C. What? Spain's biggest photography exhibition. Event 'Veranos de la Villa' (Summer in the City). What? Concerts and theatrical performances. The official site this year isn't up yet, but this page says that Earth, Wind and Fire and Elvis Costello will be performing. What? Guitar festival. Flamenco, classical and other forms of guitar will be on display. Where? Getxo, near Bilbao, in the Basque Country. What? Blues festival on the Costa del Sol. Event Concierto de las Velas. What? Candlelit nighttime concerts. The Winebus organizes tours to Pedraza for this event, with wine tastings on the way. Event Running of the Bulls at the San Fermin Festival. What? Internationally infamous bull running festival. Actually running with the bulls is not recommended. However, if you insist on running, read these tips on running with the bulls first. What? Bull run to the water's edge. What? Rock and pop music festival. Headliners in 2013 include Depeche Mode, Kings of Leon and Green Day. Where? Sierra Mágina, Torres, Jaén. What? Sword dancing, fireworks, contests general festivities. Where? Popular in Andalusia and parts of Madrid. What? . Celebrations vary in style and timing throughout the country. On the Sunday is the 'naval battle of Vallecas', a giant water fight in Vallecas, a district of Madrid, starting at c/Peña Gorbea. See a video from the water fight or read about Virgen del Carmen in Andalusia. Where? Benicassim, near Castellon de la Plana (between Barcelona and Valencia). What? one of the biggest music festivals in Europe. On the mainstream side of the alternative music scene, featuring some of the biggest bands from the UK, the US and the rest of Europe. What? One of the highlights of the international windsurfing calendar. What? A celebration of nudism. In 2013 the skinny-dipping world record was set on this day on a beach in Almeria. What? Stilt dancing. Dances take place after mass, at around midday. What? A bull run, in the style of the Pamplona Running of the Bulls. What? Religious festival. A popular time for pilgrims on the Camino de Santiago to finish their trek. What?Festival to celebrate the feast of Santa Ana. Bars line Calle Betis, a street in Triana in Seville. On July 25 there is a special mass and religious procession. What? Those who have had a brush with death in the past year are carried through the streets in coffins to thank Saint Marta, the 'patron saint of death'. Bizarre.